This category contains client success stories that show HOW YOU CAN TURN THINGS AROUND, SAVE YOUR RELATIONSHIP, and BUILD THE LOVING AND FULFILLING PARTNERSHIP YOU BOTH CRAVE. Have you ever thought your partner was wrong for being the way they are and then gotten angry because they won’t take your advice and they can’t be who you want them to be? I was working with a couple recently, and they weren’t seeing eye to eye about work. Elaine is working on a huge time consuming project that she loves, is taking care of her aging mother, and works as a life coach. She spends a lot of time doing all kinds of things that she loves while her sweetheart has a job that he doesn’t particularly like. But to her, just focusing on her project would be like death. She cares for her mother, she loves her coaching AND she loves the project she’s working on. Elaine looks at Sam and sees him in a job that he hates. She hears him express his unhappiness about what he’s doing. She cares about him so she gives him the advice to do something that he loves, because that’s what she, as a woman, would put her attention on. It’s all about life enhancement for women. So she encourages him to do something that will enhance his life. However, her input gets brushed aside because what he’s doing provides for himself and his son. He can’t see himself leaving his job until his 15 year old son is grown. On the surface, it looked like they’re helping each other. But because they didn’t understand how the other one operated in the world, they were unintentionally hurting each other. If this type of conversation gets a foothold in your relationship, it can mean breakup or years of frustration. When we worked together, Sam began to understand that his sweetheart loved what she was doing, and the best way to support her was to make sure she was getting some quality down time to nurture herself so she could do what she loved. Elaine got that the best way to support him was to plant seeds for him that would help him leave his job and move onto something more fulfilling when his son was 18. Understanding how your partner operates in the world not only averts relationship disaster, it creates the foundation for a life of relationship bliss. If you want to learn more about the instinctual differences between men and women and how to avoid letting them run your relationship amok, schedule a 30-minute appointment with me to discuss your unique situation and goals and what you can start doing right away to achieve them. I worked with a couple, Julie and Tom, who came to see me shortly after they got married. They’d called each other “soul mates.” However, once they tied the knot, Julie started pointing out problems, trying to get Tom to fit into the image she wanted her marriage to be like. In her attempt to nip the problems in the bud, she initiated conversations with Tom. She told him about the sadness and worry she was feeling. She expressed her disappointment and frustration with the way things were going between them, and she tried to tell him what was important to her. Guys will back out when they can’t make you happy. They turn off. They see your happiness as vitally important and your unhappiness as a sign of their failure. It’s evidence to them that they can’t fix it. And over time, they shut down, spiraling into inertia. Men don’t try, they only do. Can you see how that’s a set up for relationship failure? The more Tom backed away, the more fear Julie had about their future, the more angry she became and the more she tried to get him to understand what needed to be “fixed.” It was a downward spiral. The problem is that our brains are wired to look for danger and things we don’t like, and to call up past memories, so we don’t make the same mistakes again. It’s an attempt to avert disaster. It’s our survival instinct. In order to make changes that will get you what you want, you must retrain your mind to see something other than what you’re wired to look for. Julie and Tom had forgotten to high-light what was working in their relationship and express appreciation and gratitude for each other. They were letting fear get in the way of their love for each other. Love survives the inevitable ups and downs in relationships when we are conscious about where we put our attention and focus, and choose instead to express what we appreciate about our partner regularly to them. Julie started coaching with me first, and what I worked on with her was to bring her focus back to the present moment and to turn her attention on what she liked, appreciated and valued – to remember why she had married Tom. It was hard to do when we started working together because there was so much tension between them, but she was committed and persevered. I had her call her energy back into this present moment by catching herself when she started worrying. She was re-training her mind to look for the things that she liked, appreciated, and were working, and then express them and only them to Tom. Tom had to get himself into the present moment too. He’d been reacting with anger to Julie because of a memory of his previous long-term relationship that had ended badly. He’d seen himself as a failure. My work with Tom was to heal the memory of his past relationship, so that he wasn’t projecting worry onto his marriage with Julie. By being in the present moment and focusing their attention and energy on what was working, they’ve been able to remember why they got married and co-create the future they truly want together. Through our work together, they began expressing gratitude and appreciation for each other daily and enhanced the love they have for each other. If you’re experiencing similar challenges in your relationship and wondering what you can do to turn things around, schedule a 30-minute appointment with me to discuss your unique situation and goals and what you can start doing right away to achieve them. When men and women get into partnership, things like safety can create tension and break relationships up when they aren’t addressed. During her coaching session, she began to understand why Brett wasn’t concerned at all about the house and the safety. He’s a big man and had never in his life experienced a physical threat. Not only that, because he sees himself as her protector, he knew he was protecting her. Something she didn’t understand by his casualness in addressing her concerns. He’s say things like, “it’s fine, just let it go,” and “you’re making a big deal out of nothing.” Unfortunately, this was only making her feel more anxious and uncared for. Women experience real and imagined threats to their physical safety almost every day. From a man’s loud voice when he’s angry that triggers her instinctual fears, to choosing the safest parking space when parking their car. Most women take it as par for the course to pay attention to these things, however it’s something that most men will never truly understand because of how they experience the world. 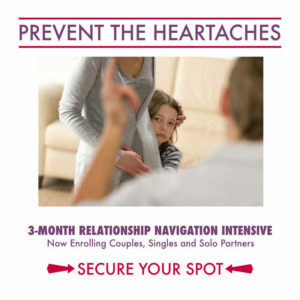 If you and your partner are struggling to find harmony in your relationship, schedule a 30-minute appointment with me to discuss your unique situation and goals and what you can start doing right away to achieve them. Fear of failure makes you hide from the inevitable breakup. But it also makes you hide from a real solution. If breaking up is the last thing you want, and you have no idea what to do to turn things around, read on because waiting until you’ve said horrible things to each other and you’re seething in anger never works. One of my clients, I’ll call Margaret, reached out to me in February. She was terrified that her relationship was failing. She had good evidence that things were grim. Her husband, I’ll call Mark, had told her he wanted a divorce and was looking on dating sites. Mark was no longer willing to talk with her about their relationship. He pushed Margaret away at every turn. It felt like the life, trust and family they’d been building for the last 12 years was being ripped away from her, and they have a two year old daughter. The good news is that she reached out before Mark had moved out. The problem was that when their daughter arrived, Margaret became Mama Bear protecting her daughter, and she’d ignored Mark’s ideas about parenting. Mama Bear mode, by the way, is extremely protective and what I’d call masculine mode. Margaret and Mark had had very different upbringings, and have very different ideas about how to raise children. This isn’t uncommon. Add to that that often the masculine and feminine have different ideas about parenting to begin with, and trouble brews. They hadn’t clarified how they wanted to raise their children and both of them had assumed they were on the same page. Which they weren’t. This happens when a couple doesn’t have clear DEALS about something. In this case it was raising children. Mark couldn’t even see the qualities he loved about Margaret anymore, and neither could she. Their situation had changed with the birth of their daughter, and they hadn’t renegotiated a new DEAL, so they were battling. They were both protecting and providing for their daughter in different ways, and they couldn’t even see it through the arguments. As Margaret and I began to work together, she learned how to navigate Mark’s masculine energy and make room for him to contribute to parenting their daughter. She also learned how to change her focus from the problems they were having to finding good that Mark was offering. It took about three months and now, divorce is off the table, they are planning a family vacation, and planning their next child. If you’re frustrated and scared and don’t know where to start, the first step is to be open to the possibility that nobody is misbehaving and recognize that men and women are different – you and your partner speak different languages. You love each other and resolving your differences is about developing consciousness in your relationship (it’s not about compromising). It’s about learning how to navigate your differences in ways that work to empower your sense of partnership. YOU’RE NOT ALONE – YOU HAVE RESOURCES. The other day, I was doing a Relationship Breakthrough Session with a couple who is struggling in their relationship. They’re what I call a conscious precommitted couple; they were at an impasse because they weren’t sure they were on the same page about their future. They aren’t married. Mary wants to get married. She’s 51 years old and has always wanted to get married. Dave is 54 years old, and is uncertain about getting married again, because he’s been married before. Like most Conscious Couples, they’ve made some great choices in their relationship, but what they haven’t done is make a plan for how they want their life to be. They have been winging it up until they hit a major roadblock. She’d brought up the idea of marriage early on, but because they’d been having a great time together, it has sat on the back burner for the last year and a half. Then one night at dinner, she brought it up. She thought the conversation had gone well, but it turned out that he felt broadsided. She was surprised because she thought they were on the same page. And it’s not that they aren’t, it’s just something they haven’t talked about for most of their relationship. There seems to be a fear about talking about the future of your relationship because maybe you’ll jinx it. The unfortunate thing is that when you don’t talk about it and create a plan for how you want to be together and what you want to do, you end up winging it, and when you wing it, you get “wing it” results. The universe can’t provide what you want if you’re not clear. And you can’t plan your life together unless you take the time to plan your life together! That’s why I recommend creating a Relationship Plan (in writing!) every year. Taking the time to think about and discuss what you want your life together to look like now – for the next 12 months – will keep you on the same page as a couple, and help the universe kick in its part to ensure you get great results. In the meantime, if you’ve been having problems connecting with your partner and building the relationship that you want, schedule a 30-minute appointment with me to discuss your unique situation and goals and what you can start doing right away to achieve them.